The airfield was built in 1941 or 1942. It served the Wolfsschanze, (Wolf's Lair, also known as Hitler's primary field headquarters in East Prussia) and was a landing field intended for Fieseler Storch observation and liaison aircraft. As the Storch had an extremely short takeoff and landing footprint the airfield could almost not be called as such. Yet, it was a designated area, and thus was an official airfield. The Wolfsschanze was blown up by sappers a few days before the Red Army marched in without firing a single shot. The Storch airfield was never used again as an airfield. Today half the terrain is an open field. The other half is now the Park miniatur Warmii i Mazur (Warmia-Masuria miniature Park). 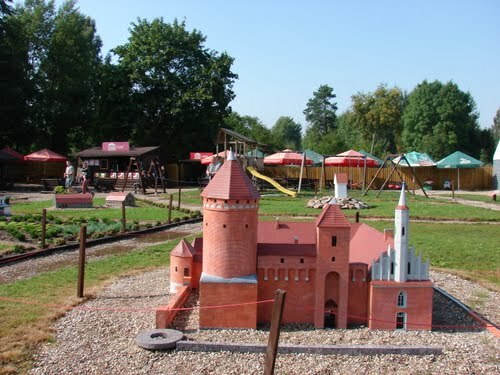 Park miniatur Warmii i Mazur (Andrzej Wacław, via Panoramio).